The Citi FM Decemba 2 Rememba concert has been launched at the plush Silver Lounge. The show is set to come off on December 24 at the Accra International Conference Center with an exciting lineup. Guests at the launch received the first taste of the 2014 Citi FM Decemba 2 Rememba, with the musicians billed to perform promising a great night, come December 24, and DJ Armani serving a mix of the hit songs of 2014. Musicians billed to perform at the official Christmas party are Guru, MzVee, M.anifest, Kontihene, Stonebwoy and Shatta Wale. 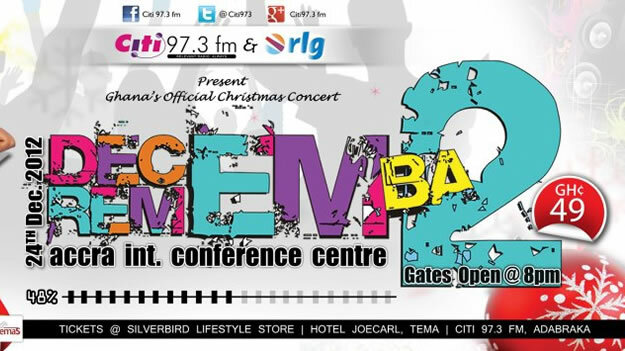 The Decemba 2 Rememba Concert is the biggest and most exciting and has for the past 9 years consolidated a place on the nation’s entertainment calendar as the official Christmas party. Shatta Wale, Stonebwoy and MzVee are expected to set the auditorium on fire with their back to back Dancehall hits. The three musicians have successfully ruled the Dancehall space in the Ghanaian music industry and managed to top the various mainstream charts during the year. M.anifest has been one of the main lyrical champions this year and has performed on countless platforms, both home and abroad. His classic hits, Someway Bi and No Shortcut to Heaven have made their way on to every playlist in the country. Guru has been one of the most engaging acts for the past five years and has consolidated his position as a force to reckon with this year by releasing back to back hits, including his recent Kpa Kpa Kpa Movement and Pooley. Nana Kontihene is a hiplife music legend. His first album ruled the then Ghana Music Awards and he’s been on top of the game since. He’s promised a night of good music with a playlist that goes way back to the early days of hiplife music. Ghanaians can be a part of the Decemba 2 Rememba experience on Facebook, Twitter, instagram and Google plus using the hash tag #D2R2014 . Decemba 2 Rememba! If it’s not a hit, it’s not on our list!